We are metaphorically euphoric due to this Whirligig Interview with C.K. Itamura. C.K. Itamura is an interdisciplinary artist, designer and producer. 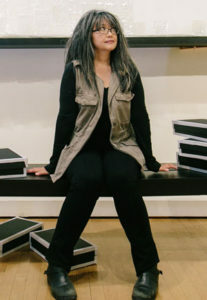 Her work responds to a wide range of personal and social content; and is realized as richly engaging, metaphorically layered, participatory, conceptual installations. C.K. is currently exhibiting a trilogy of works under the theme of s+oryprobl=m, in three North Bay locations. Read about them with her interview here. Our own exhibitions during the month of May include: The Art of the Book at Seager Gray Gallery in Mill Valley, California; and #Resist at the Nave Gallery in Somerset, Massachusetts. Opening Reception: September 4, 6 – 9pm. Kent’s recent public art project is up in four locations in North Fair Oaks, our home community. Our imprint, Hunger Button Books, will be at this year’s Jam event, put on by the Bay Area Book Artists. Whirligig is all tooled up over a new interview with metal arts artist Valerie Raps and her recent public art project for San José’s Alum Rock History Corridor Project. Cultivating Community is a life-size, stylized spring tooth harrow created from fabricated steel and cast bronze. 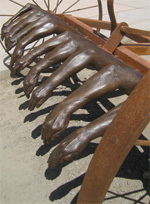 The tines of the harrow are made from casting the arms of ten San José community members. The sculpture is located at Tropicana Shopping Center at King and Story Roads in East San José. The dedication ceremony is Saturday, October 29, 10:15 – 11:30 am.